We hope that our clients will stay with us indefinitely, however occasionally a client will choose to leave the invoice finance company that we introduce them to, in favour of an alternative. However, that is not always the end of the story. Like boomerangs, sometimes they come back! 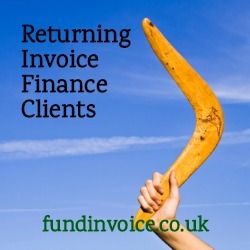 I was pleased to see a recent example of a client recontacting FundInvoice, after having left us, wanting us to help them find a replacement invoice finance company. We are always happy to reconnect with ex-clients, we offer them the same impartial, personal service that we offer all our customers. Overall, we have an average customer satisfaction rating of 4.9 stars, out of a possible 5 stars, so that speaks to the service that we provide. Another important aspect is keeping in touch. In this particular case, it looks like our monthly magazine, FundingVoice, may have sparked their renewed interest. It goes out to a large list of subscribers, including many companies that we have dealt with in the past. You can subscribe free of charge, to our magazine. OK, this isn't a done deal yet, but I thought it was nice to demonstrate that even the clients that leave us often come back again, when circumstances change, and we always try and keep in touch whether they are using a facility through us, or not. The average client life in the invoice finance sector is just over 5 years in total, but on average clients move providers once during that period. We are here to support companies at all stages of that life, whether it's explaining the options, benefits and drawbacks, when you first take up a facility, or if its finding an alternative facility, and supporting you when you want to switch providers. This can be for any reason including releasing more funding, decreasing the charges, improving service levels or improving the relationship that you have with your funding provider. We can even support you if you want leave invoice finance altogether by giving you access to alternative forms of transitional finance such as business loans.